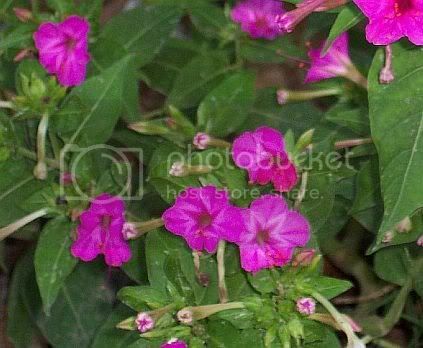 Silly me, I've had a neighbourgh (the street behind us) grow pink four o'clocks on her front lawn in a giant pot all this time and I've been looking for the seeds, well, now I know where to get the pink ones! 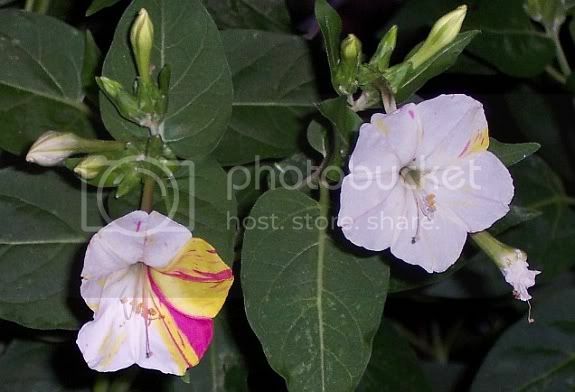 Everyone who sent me all those different colours of four o'clocks: thank you so much! Now the question that comes to mind is: how do I grow these ? I tossed them into the ground this year and watered them, nothing sprouted, tried to start them in paper towels, they just grow mould and never germinated. I tried starting them inside a few weeks before the last frost, they didn't sprout! I surface sowed some and covered some, and kept them all warm (next to the air vent) and kept them moist, still nothing ! I've even tried to sow a few of those now outisde (figuring this hot weather might help) over a week ago, but still nothing (they're only supposeed to take five days). Anyone offer any help? Good thing I didn't try sowing all the seeds that I received just now or else I wouldn't have any left for next year! Thanks guys! These are a Tender Perennial (Usually grown as an annual). So anywhere where it freezes it will not survive. They produce tubers that can be dug in the fall and planted again the following spring after the last chance of frost. That's so beautiful, now I'm really jealous and want a four o'clock! I had real good results this year w/my 4o'clocks. They grew major stalks too and I was able to collect a good amount of seeds till I just gave up and let the red birds have them all. I also moved some of they smaller plants in hopes of producing a boarder along the fence line. The colors I have are mixed including the fushia color above, white ones, yellow and some very pretty light pink. I was also able to give numerous seedlings to my son in law (who is now hooked on gardening) The evening fragrance is awesome. My question to every and anyone is do I have to dig up the tuber when they die out? I have mulched very well and dont really look forward to that chore. Except for a few days of what we consider "cold" here in Texas it was basically a mild winter. Maybe I'll take my chances. D, you won't have any problem with your Fours overwintering there. The tubers will just keep getting larger as they age. If you get a hard frost, you'll probably lose the foliage but the tubers will be A-OK in the ground. I also have two different shades of solid yellow, pure white, white with lavender streaks, white with pink freckles, pale coral, darker shade of orange I call Tangerine, etc. The broken-colors are really fun because you will see so many different "looks" on a single plant. I joke with the neighbors that the Fours are having an identity crisis. lol! so beautiful! I never knew that there were so many types of broken colour!